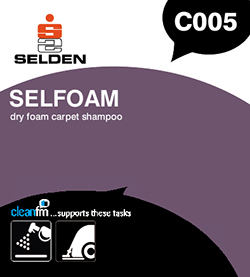 Active foam suspends dirt, then dries to a non sticky powder which is readily vacuumed away. Foam cleaning prevents soaking of carpets, ensures quick drying. Safe on all fast dye carpets. Does not leave sticky deposits. Cleans, brightens and helps prevent re-soiling of carpets. Use in accordance with machine manufacturer's recommendations. In general dilute Selfoam 1 part to 15 parts warm water for automatic machines. Dilute Selfoam 1 part to 15 parts water for hand use. Apply fluid sparingly, work up to a good lather with brush. Leave to dry. Vacuum thoroughly. N.B. Test a small inconspicuous area of carpet for colour fastness before commencing cleaning. Use in accordance with machine manufacturer's recommendations. In general dilute Selfoam 1 part to 15 parts warm water for automatic machines. Dilute Selfoam 1 part to 10 parts water for hand use. Apply fluid sparingly, work up to a good lather with brush. Leave to dry. Vacuum thoroughly. N.B. Not suitable for use with hot water extraction machine. N.B. Test a small inconspicuous area of carpet for colour fastness before commencing cleaning. Coverage: 12-30 square metres per litre dependent on type of machines and thickness of carpet. Stability 2 Years in unopened containers in ambient temperatures.Shaking/warming will disperse any settlement.